Make Money Helping other people pass the NREMT test! 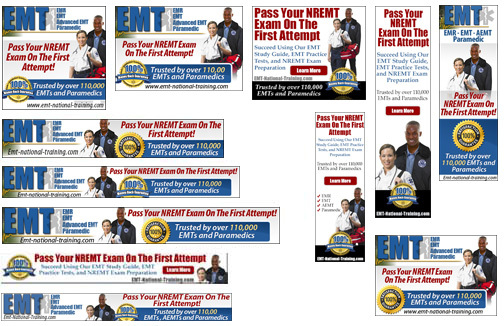 You use the banners, buttons and text links that we provide to send visitors to EMT National Training. Our affiliate program generates a unique link for each affiliate that you can just copy and paste into a webpage, blog or email. For every visitor that signs up for our EMT practice tests you receive commission of 30%. You have access to detailed real time statistics that show how many visitors you are sending, where they are coming from and how much you have earned. It's that easy. Anyone, but our affiliate program was really created for four groups of people. 1. Students who have used our EMT practice tests and would like to recommend them to other students in their class and make some extra money. 2. Instructors who teach EMT classes regularly and would like to earn some extra income recommending our useful product. 3. EMT's who spend time on on EMS related bulletin boards and chat rooms who would like to make some extra money. All payouts are done through Paypal. You must have a free Paypal account in order for us to pay you. Is there anything I can't do? 1. Sending out unsolicited emails to people with the sole purpose of selling them on EMT National Training. 2. Using our banners or links in posts on bulletin boards and chatrooms were it is a violation of the board's policies. 1. Put our banner or link on your existing website and earn 30% for every person that signs up. 2. Put our banner or link in your email signature that you send to friends and family and earn 30% for every person that signs up..
3. Put our banner or link in your bulletin board or chatroom signature where you CONTRIBUTE and earn 30% for every person that signs up..
4. Put our link or banner on your website and earn 30% of each sign up that is generated. 5. Send an advertisement, article or promotion to your opted in emailing list. 6. Have our link tattooed on your back or chest and have people laugh at you. So, all that being said. If we get a complaint about one of our affiliates using spam techinques we will give one warning. If it happens a second time the account will be terminated. Go to the Affiliate Signup Page here. It's quick and free. Once you are signed up you will receive an email with the information necessary to login to the member area and retrieve HTML code for using our banners and view your sales statistics. you get get credit and it shows up in your stats!